Sometimes we come across funny things we like to share. 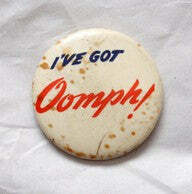 This old pin is a classic we found when we googled oomph the other day. We are not sure who handed these out or why but maybe we should include one with every sale? Another favorite. . . Now this one we are experts on! This must be true or it wouldn't be in the paper. Some oomph we found packed a punch. We sometimes describe our products as "POW" colors.